As the temperatures rise on college campuses across the country, students have been taking advantage of the wide, open areas of grass between dorms and academic buildings, sometimes known as a campus green or quad. Whether for studying, sports or simply laying around, quad rules should be understood by all. There are a lot of ways to use the quad to your advantage, depending on what you want to use it for. It's important not to get in other people’s way or draw a huge amount of attention to yourself. There are perks for studying outside, but there are generally more setbacks to being outdoors for your focused study time. It is easy to get distracted by the sunshine and passersby, taking attention away from your studies. Being outside also means no outlets and limited laptop use, which eliminates the types of work that one can do. The best type of studying is simple textbook reading as well as limiting as much time/reading as possible to prevent lying around for hours and not getting anything done. Studying indoors is more effective than outdoors; however, picking out a patch of grass to do some last-minute homework in between classes can save a lot of time. 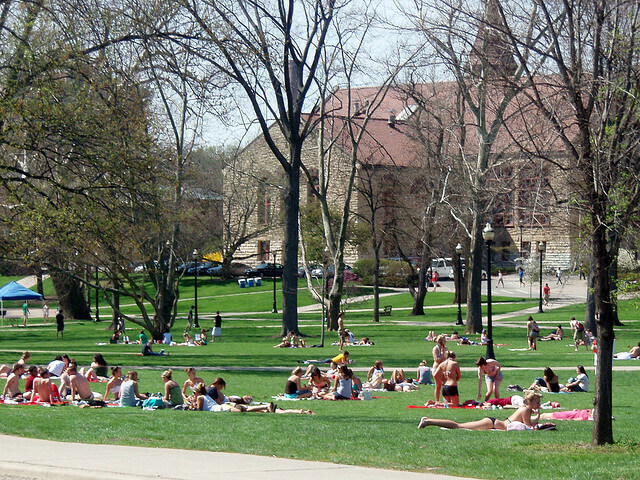 The quad is primarily used for fun things, such as playing sports or trying to catch a tan. Besides bringing necessary sports equipment like a ball or Frisbee, having a separate towel to throw out or even a cheap beach chair can keep your clothes clean and off the dirt. Always carrying a pair of sunglasses (besides obvious functionality, of course) allows for impromptu quad people-watching and relaxing. Most items are small enough to fit into a backpack, perfect for blowing off steam and enjoying the sunshine.